A week removed from DSE and I’m head deep into preparing for SXSW (we support one of our clients – Chevrolet – for their SXSW Super Sponsorship). Next week, the activation that I’m leading kicks off as 10 teams from North America roadtrip down to Austin and document their journeys. The timing of DSE & SXSW presents many challenges for me, but it’s all about balance, right? I’ve had time to reflect on my three days at DSE and now, I’m finding the time to document it. So, here you go, today’s Friday 4-1-1 is dedicated to my takeaways. 1. Non-digital signage player keynotes are good – Shelly Palmer – someone who has nothing to do with digital signage – gave the keynote address. He spoke about how technology has changed our way of life (speed and scale) and loosely tied it to the digital signage industry. I thought it was refreshing, and even more, I thought it was important for the audience to hear someone a) removed from the industry and b) in tune with how consumers consume media and connect with each other through technology. He made a lot of great points and I really hope the majority of that audience walked out of the room as jazzed as I did. He was good. He doesn’t have a stake in the industry, per se, but certainly has a worthwhile perspective, given his knowledge and expertise. The nut of his presentation – technology is meaningless unless it changes the way we behave. I think it’s a great filter for everyone in the digital signage industry – does your solution change the way people behave? If not, what can you do to the solution to make it so? 2. The digital signage industry is not cutting edge in daily practice – This is definitely a general statement, but one of the questions that Shelly Palmer asked in his keynote was “how many of the audience has their information feeds set up through something like Google Reader?” And, at best, 10% of the audience raised their hands. I just find it ironic that an industry thought of as an emerging one does not apply some of the fundamental practices of the digital world. For those of you who don’t have feeds set up, Google Reader is a simple and effective tool. Go there, copy and paste your favorite URL’s and start getting all of that content in one single place. More than it being an aggregator for all of my favorite sites, I use it as a monitoring tool for trends and issues. For anyone who is creating a product that consumers will ultimately consume, it’s essential that you understand how they’re using like products and/or what they’re saying about them and/or who’s saying it. Google Reader is a great way to start understanding all of that information. 3. The “Content is King” talk is cheap – I can’t tell you how many times I heard “content is king” from different people. To everyone’s credit this year, I didn’t hear a peep of that last year. So, there is wide-spread recognition in the industry that content is important. But what’s new? Content is the thing. It always will be. For all of the talk about content, I didn’t see much of it from anyone on the showroom floor. Again, I’m left scratching my head. Nothing – in and out of this industry – is about technology. Technology is a means to an end and it can certainly change the way that we behave. But there is nothing more important than content. Never will be. So, can we all stop it with this phrase? It’s buzzed to the point of being laughable. 4. Relationships trump everything – I mean, if anything is the “king,” it’s relationships. Without relationships, nothing is sustainable. I am so thankful for all of the relationships I’ve been able to form in this industry. It’s filled with great people. To me, the best thing about DSE was connecting and re-connecting with those I know and met for the first time. Way better than any session and/or anything I saw on the showroom floor. If you want to focus on one thing at a conference like this, you can’t go wrong with focusing on the people. All else pales in comparison. “Uh-huh” – The show organizers are great. Thank you, again, to Gerri. I will forever be grateful to you. Angelo and Chris – thank-you as well. And to those sweet, stand-your-ground hosts of the blogger lounge – you rock. “Duh” – My golf game needs a little bit of help. I didn’t do bad for not playing in 2 years. But, if they do it again next year, and my team accepts me back, I’ll play a couple of practice rounds before-hand. All in all, it was a great show. I saw lots of improvements over last year. They’re really trying to put the focus on content and interactivity and pull new people in to this. They’ve done a great job with their approach to education throughout the year, and you could feel it at the show. There’s a fairly long road to go, but they’ve got great minds trying to push this into something that is attractive and valuable for everyone outside of the industry. Thanks, as always, for reading. Happy weekend! This entry was posted in Digital Signage, Friday 4-1-1 and tagged Conferences, Digital Signage, DSE, Friday 4-1-1 on 03/05/2011 by Mike Cearley. I had the pleasure of playing golf with some great guys early this week, my kick-off to DSE. I played with Dave Haynes, Bill Trainor and Andy Bruce (first time meeting Bill and Andy – great guys). All told, there were about 40 people (all in the industry) at the outing, and it ended up being an overall great time. Golf, almost anytime is enjoyable for me, regardless of how I play, and Monday was no exception. It’s such a great game and although I find it extremely frustrating most of the times, it can be equally rewarding. Just like work. There are many parallels. So, today’s Friday 4-1-1 is dedicated to those parallels. 4. 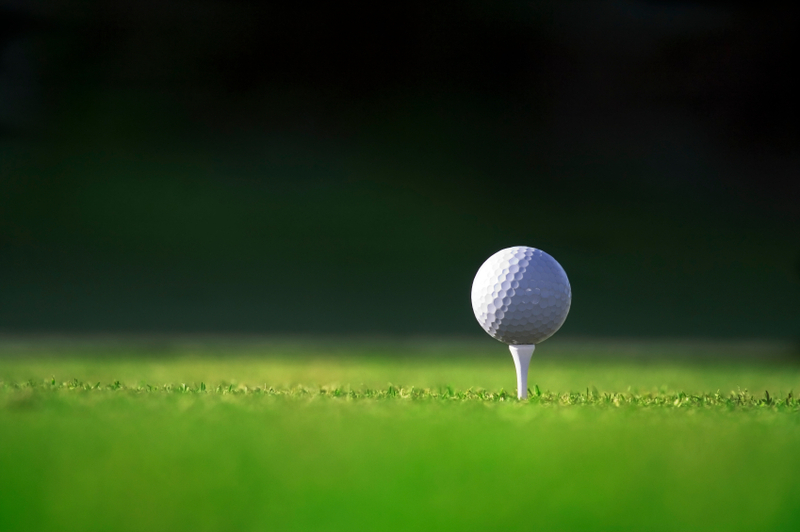 Persistence – golf if a game of persistence. Unless you want to give up and walk off the course. But for those who want to get better, you have to just keep plugging along. And it’s as simple as that. I’m big on persistence. “Uh-huh” – Golf is one of those things, like many of those at work, where you can see marked improvement with deliberate practice. If you work on specific aspects of your swing, or of your stance, or of your mentality, and you’re deliberate about it, you will see improvement. It’s the same with work – if there are specific aspects of your work, be it the way you communicate with people, the way you react to situations, the way you deliver a presentation – whatever it is, if you are deliberate in your practice, you will see improvement. “Duh” – Although two of my best shots were the first and the last shot I hit, there were many more that were not good. Doing something good once or twice or even for short periods of time is not the goal. The goal is to sustain a high level of performance over a long period of time. All of those in-between moments are much more important than 2 singular ones, even if they are important singular ones. All it takes in golf is one good shot to keep you coming back. The sense of pride and accomplishment you feel is self-motivating. I think you could apply that to anything you do in life or work that you want to do a good job at – when you do it, it keeps you coming back for more. Happy weekend, everyone. Thanks, again, for reading! This entry was posted in Friday 4-1-1, Marketing and tagged Conferences, Dave Haynes, DSE, Friday 4-1-1, golf on 02/25/2011 by Mike Cearley. 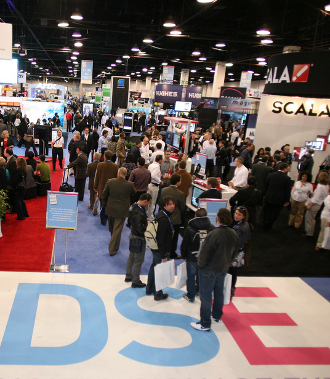 The Digital Signage Expo (DSE) holds a special place in my heart. It’s the first conference I covered as “press,” it’s the first time I was really in the know, behind the scenes, the first time I met all of my industry friends face-to-face – in a lot of ways, it was THE thing that really put my blog on the radar for many in the industry. I will be eternally grateful to Geri Wolff (responsible for organizing the entire thing) for taking a chance on someone she’d never heard of and letting me in (as press). So, Monday, I’m off again for this year’s DSE. I’ve got a different schedule this year because I’m taking part in a few pre-conference activities and by the time it’s over, I will end up missing the last day of sessions. But this is a busy time of year back at work (preparing for SXSW) so I’ve got to make a couple of sacrifices. Today’s Friday 4-1-1 is dedicated to some of the things I’m looking forward to this year. 1. There’s nothing more important than relationships and I’ve been fortunate enough to meet some really great people in this industry. Most of them will be here this week and I’m looking forward to seeing them again. I talk to many of them on a daily basis so I’m sure we’ll pick up as if no time has passed since we actually saw each other. There’s no substitute for face-to-face time and I’m going to take advantage of it. 2. The Preset Group Mixer – I wasn’t able to attend last year, although the guys at Preset were kind enough to invite me last minute. I was buried in SXSW to-dos. Not this year. I’ll be there and I’m really looking forward to it. I suspect I’ll see alot of people that I already know, but many more who I don’t. The guys at Preset are top notch, so I suspect this mixer will be the same. 3. 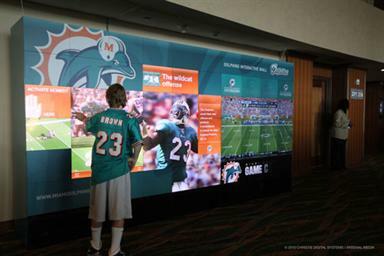 Christie MicroTiles’/Arsenal Media’s BuzzWall – 7′ tall, made up of 41 tiles, multi-touch, multi-user, recently installed for the Miami Dolphins. Sounds a lot like the Hard Rock Cafe’s Rock Wall, just different hardware (which I suspect is what makes this pretty cool). Here in Dallas, Jerry doesn’t even have one of these in his place. I’ve got to see it in action. 4. Wednesday morning’s morning sessions – DSE/DSF has really done a good job this year of focusing the educational sessions. There are various tracks, and they’re actually good and seem to be geared to more than 101-type sessions. There’s a content track (fantastic move! ), an interactive technology track, a business track, and 6 others. Wednesday morning, I’ve got to decide between the Content session, the Marketing/Advertising session, and the Interactive session. All look to be awesome. At this point, the Advertising/Marketing session is the favorite. “Uh-huh” – Like I said, Geri Wolff, has been extremely kind to me and I can’t thank her enough. She’s kept in touch with me over the year and has really treated me well. I’m looking forward to thanking her face-to-face. “Duh” – I’m teeing it up for a little golf outing with Dave Haynes, Bill Trainor, and Andy Bruce. I haven’t played in a couple of years. I have no idea how it’s going to be. If nothing else, it will no doubt, be fun. Hope I represent, though. If you’re going to DSE and you’d like to get together, drop me a line and let me know. As always, thanks for reading! This entry was posted in Digital Signage, Friday 4-1-1 and tagged Aresenal Media, BuzzWall, Christie MicroTiles, Conferences, Digital Signage, DSE, Friday 4-1-1, Rock Wall, The Preset Group on 02/19/2011 by Mike Cearley. More often than not, things don’t happen the way we expect them to. Take this week for example – here in Dallas, the week before the biggest sporting event of the year, it was supposed to be filled with excitement and energy, people bustling here and there, setting the city abuzz. Then, Icepocalypse happened. Then, the snow happened. 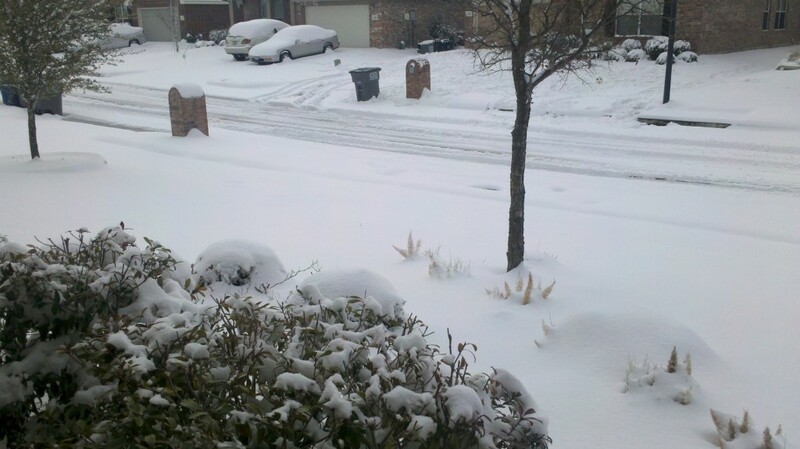 All week, the city (and metroplex) has been essentially shut down because of the weather. If things are abuzz, I wouldn’t know because my view has been limited to the four walls of my house and news reports. It has thrown a major wrench in things. I’ve been thrown out of my routine. It’s been frustrating. But that’s an easy first reaction. When I step back and really think about this week, though, I am reminded of some simple, core truths that give me a different perspective. And this week doesn’t seem so frustrating after all. So, today’s Friday 4-1-1 is all about what we can learn from being snowed in. 1. Be patient – Yes, grasshopper, you must be patient. But it’s so hard, especially when you’re not born with it. And especially when things aren’t going the way you want them to go. I’ve found that the easiest way to actually become patient (yes, it is an active exercise with me) is to breathe. Sounds simple. It is. If you feel yourself losing patience with someone or something, slow down, take a couple of deep breaths, and get yourself centered. Think about how you’re going to react or what you’re going to do before you actually do it. Those couple of seconds of “nothing” will help. The thing about patience is – everyone needs it. Both giving and receiving. And while it might be frustrating, most anything with patience sprinkled in turns out in a productive way. 2. We can only control what we can control – Weather is one thing, other people’s actions are another. Both are things I can’t control. It’s easy to get frustrated at everything out of our control – the weather, the way people drive, the way people act, the decisions they make, the things they say. What is in our control, though, is how we respond to situations and problems and people. If you strip everything down and ask yourself, “what is it about X that I can control?,” more often than not, it’s an easy answer to find. Then, it’s just a matter of doing it. Many things require a reciprocating action in order to actually get done/resolved/settled. We ultimately can’t control that other side, which is challenging, but as long as we’re doing everything in our control to get it done/resolved/settled, we can be more peaceful and proud than not. 3. Anticipate the need to be flexible – How many times have you seen someone (or even you?) dig their heels in and not budge? In my experience, the result is most always not good. To think that we can’t/shouldn’t be flexible is just foolish. Fair, consistent, convicted – all of these things are important, but flexibility is key. Even more is the ability to anticipate the need to be flexible. To know, going into a situation or a discussion, that you might have to dig your heels OUT, only allows you to do it easier and often times, more graceful. 4. Enjoy the beauty around you – I almost categorized this as, “Enjoy the snow,” but having lived in NYC for a time, I know it’s easy to despise the snow, regardless of how beautiful it is. Down here in Texas, we don’t get much snow. When we do, it’s a treat. I think that there’s an element to snow that’s really magical. It reminds me of my childhood and visiting my grandparents in the mountains of Colorado. So, even when it’s a nuisance (like now), it’s a beauty (to me) that can’t be overlooked. Taking note of these things and the time to appreciate them could make all the difference between a bad day and a good one. “Duh” – Can this week come to an end already? And the snow melt? I mean, I would really love to venture outside and actually see people. I miss my office mates and my friends. I. Want. This. To. Be. Over. This entry was posted in Friday 4-1-1, Marketing and tagged Fantasy Football, Friday 4-1-1, Superbowl on 02/04/2011 by Mike Cearley. Friday’s 4-1-1, What’s Coors Light Doing Style? I really didn’t know what to make of this when I saw it. I was in a rush and I caught a glimpse of something familiar on my way out the convenience store door (and it wasn’t the girl!) That tag. The same thing that Bud Light just used? I mean, I can see the value of using code and/or image recognition on your packaging to drive a deeper experience, but I find it interesting that Coors Light chose to do the same exact thing their biggest competitor – Bud Light – chose to do only a few months ago. I stood for a split second in disbelief – the others in the store thought I was just staring at the display – then, I took a photo and went on my very way. I thought it was such a blatant rip-off that I didn’t want to snap the tag on the box or have anything to do with Coors Light, but the next time I found myself in a grocery store, I had to stop by the beer and see what it was all about. I got a text message back, directing me to a site, and an option to receive more texts. So, now I’m in their communication stream. We’ll see what happens. I thought I’d spend today’s Friday 4-1-1 reflecting a little deeper on this experience – because there are solid components here – instead of instantly shutting them off since I’d seen this before. 1. On the surface, all codes are created equal – the one thing that is different between all of the image and code-scanning technologies is whether or not you need a special app on your phone to engage with it. And really, you just need the app to read the image (i.e. Google Goggles) or code (i.e. QR code/MS Tag). They all open the door to the same content. I’ve found these image recognition technologies (SnapTag and JagTag) need a couple more clicks to access the content, but to me, it’s not an inconvenience in the experience. 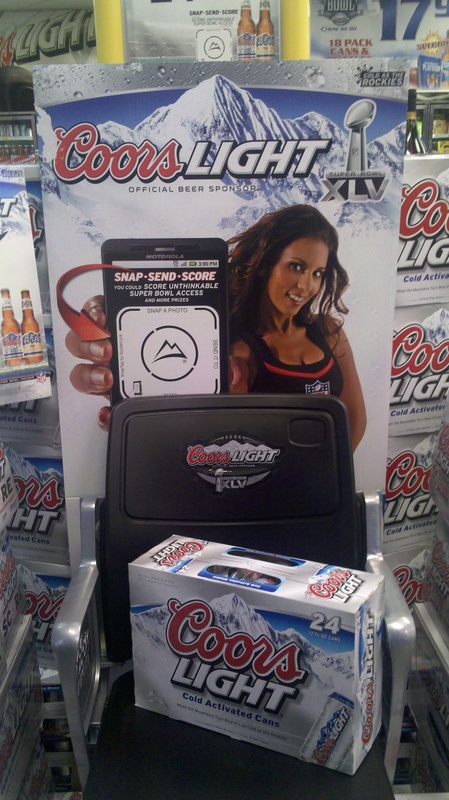 Question for Coors Light is why use the same exact technology (SnapTag) that Bud Light just used? I doubt there was such a huge wave of success from Bud Light’s campaign that they felt they needed to ride it?? I would have picked another one. Because they all do the same thing. Plus rich content like videos and sharable memes – the Ditka Cold Call to your friends is my favorite. And I’m in their communication stream via text message. See the power of codes? More and more, marketers are realizing this low-cost technology can enable deeper brand experiences. And big brands like this don’t need to create special content for these extended experiences. They just need to drive people there. Welcome the code. I just would have picked another one. 3. Do consumers care? – Consumers want value and ease. These codes have the potential to provide value by unlocking deeper content, be it more brand content or coupons, and some of them are easier to use than others. These SnapTags don’t require a smartphone or an app, they just require an awareness and desire from the consumer to interact with them. So, you can’t get any easier than it already is. I would just love to know how successful these are. Anyone know the “snap rate” for the Bud Light or Coors Light campaigns? I would still recommend tags in addition to/replacement of URLs in a lot of cases because they provide instant access to the content, typically with only one click. It’s really more about consumer adoption at this point. 4. OOH has a definite place in the ecosystem – and more than that, has a definite place in code-based campaign ecosystems. And the OOH component doesn’t have to be “digital.” As we see here, with this static in-store display, they’re stopping consumers and making them aware. I think anyone who’s considering implementing a campaign like this should take note of the simple solutions used here. You can’t get any more lowfi, but in my opinion, it’s incredibly effective . “Duh” – I just don’t get the decision here. In fairness, I’m not involved in any of the brand/agency conversations, but you’d think someone would have raised this and really questioned using the same code technology. I think, more than anything, this shows how wide-open this space (code/image scanning) is, with no clear leader. And consumers haven’t tipped to one technology over another. There’s still a lot of experimentation going on. At the heart, this is another good example of a multi-channel brand experience (and a pretty deep one at that). And for me, it all started with an OOH component. It shows how important it is to stop people when they’re out and about and engage them in some way. Here it was through the image-scanning technology. I just would have picked another one. 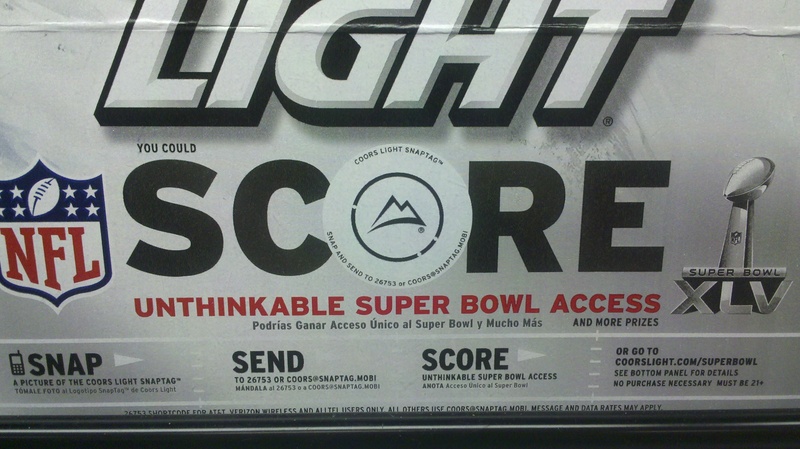 This entry was posted in Emerging Technology, Friday 4-1-1 and tagged Bud Light, Coors Light, Friday 4-1-1, JagTag, Mobile, MS Tags, QR Codes, SnapTag on 01/22/2011 by Mike Cearley. My daughter is 2 classes into taking ballet class and as a 5 year old, it’s less about the finer points of ballet and more about dressing up in tutus and dancing around the room with all the other little girls. She also has 2 younger brothers – twins, 2 1/2 years old – who do everything that she does, except participate in ballet, of course (although my wife has a hard time keeping them contained during this class.) We talk to her often about being a leader, particularly when the boys are rowdy and/or rough and/or tazmanian devils and when she chooses to be a leader, she doesn’t add to the mayhem, she helps stop it. This whole thing occurs many times during the week and sometimes she wants to be a leader and sometimes, she just wants to be a 5 year-old causing ruccus with her brothers. Well, the moment of note, here in this story, happened a couple of nights ago in her ballet class. The teacher was trying to get all the girls to stand in an orderly fashion – in 1st Position – so they could practice moves one-at-a-time across the dance floor. Well, half of the class was bouncing off the walls, playing on the mats, and half of the class was running around the class, and my daughter was in the middle. And in this moment, she was confused because she was listening to the teacher, but what she was seeing out of one eye was mat playing, and out of the other eye was running around, and she didn’t know what to do. But in that one moment, she chose to be a leader and do what the teacher was asking, and wouldn’t you know it – one by one, the girls saw what she was doing and stopped what they were doing and got in 1st Position right behind her and there was a semblance of order restored to the class. It just made my week. I think any parent, when you experience something like that, is overcome with a sense of pride and accomplishment. It really is great. But you know, it breaks being a leader down to a few simple components and that’s what I want to focus on in today’s Friday 4-1-1. 1. Choices in Moments – the littlest moments in our lives are often the ones that have the biggest impact. They define us more than we realize. In each of those moments, we have a choice to either lead or follow. I don’t believe that you always have to lead or you always have to follow, but there is always an active choice to make in those moments. 3. Active Awareness – I think the best leaders are aware of their decisions, their actions, and the consequences of both all the time. They might not know how everything is going to end up based on that one decision in that one moment in time, but they sure are aware of the immediate impact. 4. Nothing More Important than Grace – there is a right way to be a leader and a wrong way. Same can be said about being a follower. And in my opinion, it has nothing to do with skill. It’s all about grace. Being graceful in any situation, to me, is what separates great from good. “Uh-huh” – this week, my team at work had a leadership moment. They were faced with something and in that moment when they had to decide how they were going to react and then act, they chose to band together and lead. And by choosing to do that individually, the team became united and really showed what leading is all about. They put the team above each of themselves. That’s another key to leading – selflessness. It makes you stronger. “Duh” – leading is not all serious all the time, it’s meant to be fun. It’s OK to play on mats and run around the room. People can learn a lot from that, too. It shows that there is joy in your life and that you’re a person. And in the end, all leaders are just people. This week, my daughter, and then my team, reminded me of how simple it is to be a leader. It’s not something that you have to work all your life to do. It can happen right now, in this very moment. This entry was posted in Friday 4-1-1 and tagged Friday 4-1-1, Leadership on 01/15/2011 by Mike Cearley. Wow. What a week. Do I say that every Friday? It’s felt like 5 weeks back from the break, not 5 days. As you can see, I’m making some changes to the blog. I haven’t been able to get it exactly where I want it, but over the next few days, it will be there. I hope you like the change. It’s really designed to reflect the depth of this space I’m calling the 11th Screen – a bit more robust, visual, and exploratory – and hopefully, it will be just as simple to get around (or simpler!). I haven’t explored as much as I would have liked to on the Coke campaign that I posted about earlier in the week. A few people commented and gave me some insight on other components of the campaign (Kyle/Brian – thanks!) and I have been able to uncover a few more myself. But as I said, this is going to be an ongoing journey, so I expect the scope to be more filled out throughout the year. Since it’s all fresh, I thought it would be best to dedicate today’s Friday 4-1-1 to more of this Coke story. 1. Thanks to the guys at IndoorDIRECT, they clued me into a video that ran on their Restaurant Entertainment Network, specifically in Wendy’s (~200 locations). As you can see by the video, they ran a complimentary ad (to the right of the video) advertising a special offer – obtained by texting in a short code. 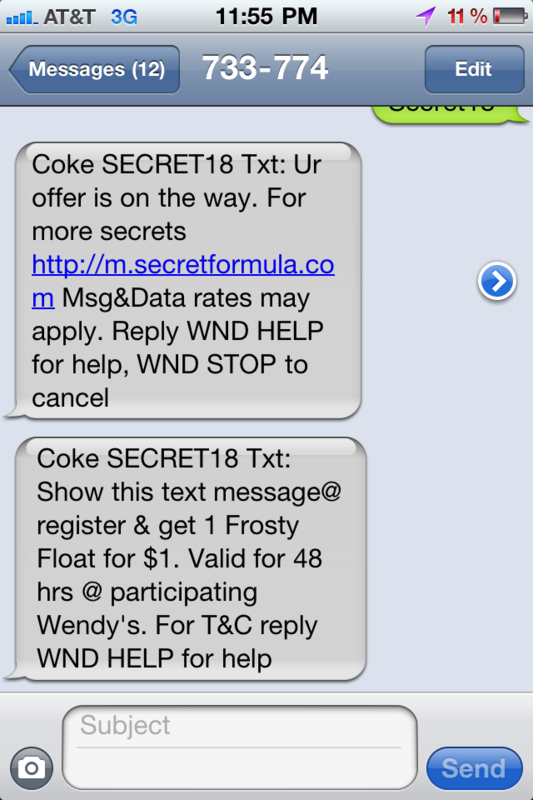 When texted in, consumers received a coupon for a $1 Frosty (Coke) Float. They also received a link directing them back to the same mobile site I experienced from the “Secret” shortcode on my bottle. Smart, although I wouldn’t expect anything else from Coke, to utilize the same mobile property and create different initiatives to drive traffic to it. This is another example of how purposeful they are about touching consumers when they’re out and about, whether in a grocery store or quick serve restaurant, and enabling them a way to engage with the brand story. And along with this whole promotion, Coke also included a nice piece of branded content by sending out the Polar Bear to give out Frostys at an LA Wendy’s to tie in the Frosty coupon offer as well. Thanks to Brian at IndoorDIRECT for bringing this to my attention, and kudos to the great work they did around this! 2. One of the best Out-of-Home experiences that I saw last year was Coke’s Happiness Machine. If you’re not familiar with it, it was a vending machine that they placed in a school (don’t know how set up it all really was?) and it delivered “doses of happiness.” See for yourself. This is great because they took an object – a “thing” – around us and turned it into an engagement vehicle. It wasn’t digital. But it was highly interactive. Through good ol’ human touch. Thanks to Kyle for sending my way! 3. Although I can’t find this feature out there, I read about Studiocom and Hypnoticmedia partnering together to create an immersive website. After two years of running its “Secret Formula” campaign in traditional media, The Coca-Cola Company discovered that its target consumers (18-35) weren’t hearing the message…Coke realized this was the perfect opportunity to both engage its audience in the digital realm and re-position the story behind the “secret.”…Studiocom filmed, developed and launched a highly-interactive, self-guided, video-driven web experience to show young consumers how Coke’s “secret” ingredients could make everyday moments better and serve as an anticdote to modern day woes. Innovative augmented reality features brought interactivity and engagement to a whole new level, allowing users to unlock additional video content using only printouts and their webcams. Quite interesting that this campaign was recently “refreshed” and targeted to millennials, which brings me to the last thing I found…. Teens (Audience) + Coke (Brand) + SCVNGR (mobile) + Malls (OOH) = the type of engagement that makes sense because it’s a) centered around the idea of interacting with teens while they’re out and about b) supporting the brand’s story in a unique way and c) the thing that could make a memorable experience for this highly impressionable and influential target audience. And memorable experiences with a brand create trust and trust creates loyalty. “Uh-huh” – as I’ve said before, in the end, it’s all about building trust-based relationships between brands and their target audience(s). In order to do this, I believe it’s imperative for brand’s to understand their story and the channels available to them. Once they understand those two fundamentals, they can only hope to utilize them to their fullest capability. Few brands do this well. Coke is one of the ones who do. “Duh” – I have not uncovered 1 2D barcode (ie – QR Code) in this short journey and I haven’t come across any while I’ve organically experience Coke myself, in my personal, everyday life. And that kinda makes me happy. As you can see by all of the technologies that they’re already using – mobile SMS, mobile location-based SCVNGR, augmented reality, that good ol’ human touch – they’re driving consumers into the brand story just fine. 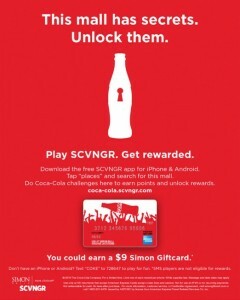 If anyone’s seen a code-based implementation for Coke, I’d love to see it. I wonder if they ban them from their arsenal? In one long week, I’ve been able to uncover a deep brand story that is being told through many channels, including OOH. The channel is powerful, for sure. It’s about understanding what you need to say, though, before getting to exactly how, or through what channel, you’re going to say it. As always, I’d appreciate any thoughts you can send my way. Have a great weekend! 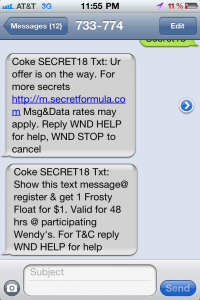 This entry was posted in Friday 4-1-1, Marketing, Mobile and tagged 11th Screen, Augmented Reality, Coke, Coke's Secret Formula, Friday 4-1-1, Mobile, OOH, SCVNGR on 01/07/2011 by Mike Cearley. For the next 15 days, I’m going to participate in Reverb 10. It’s an open online initiative that encourages participants to reflect on this year and manifest what’s next. It’s an opportunity to retreat and consider the reverberations of your year past, and those that you’d like to create in the year ahead. We’re connected by the belief that sharing our stories has the power to change us. 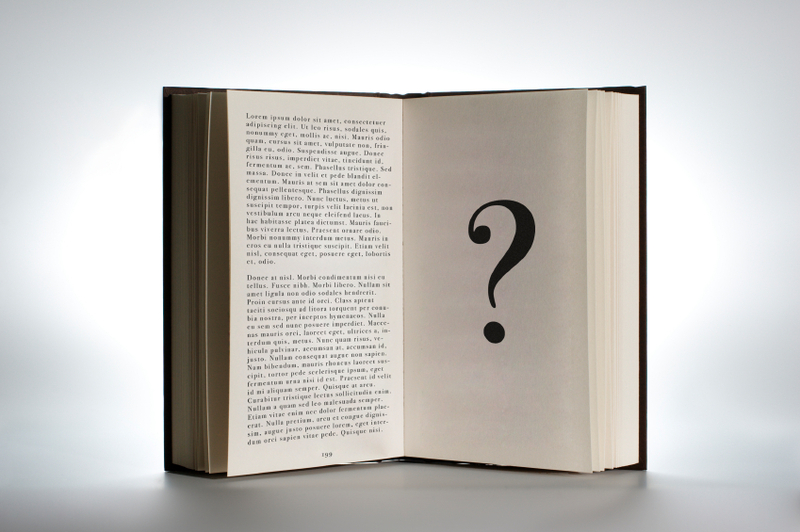 Today’s prompt – CORE STORY: What central story is at the core of you, and how do you share it with the world? It’s the end of the year, the final thoughts, the look-ahead, the last of the 2010 Friday 4-1-1’s, and the end of the Reverb10 series, all wrapped up into 1 post. And how fitting it is, stripping things down to the core, the thing that means the most – the story. My story here has been an exploration. I didn’t start with much of a plan or many key message pillars and certainly nothing in mind for a “year later.” It all started pretty simple. I was open. But what’s happened through the exploration is that I’ve actually formed a story. It’s a story that’s centered around this wide-open space we call Out-of-Home, but it’s not about screens or technology. It’s about INTERACTIVITY, and ENGAGEMENT, and the PLACES/THINGS AROUND US being able to be TURNED ON, and more than anything, it’s about TELLING the BRAND’S STORY. These 4 themes have surfaced to the top in my exploration and it’s here – with these 4 themes – that I want to focus exploring more in the coming year. These are the core themes to my story. So, today’s Friday 4-1-1 is dedicated to them. 1. INTERACTIVITY – From the beginning, I’ve latched onto the concept that Interactive Out-of-Home is markedly different than Digital Out-of-Home. They’re both centered around technology, but different types of technology that do different types of things. I believe that you can make anything interactive, be it from a digital experience or not. But what deems something truly “interactive?” Is it just the fact that a consumer can take some sort of an action? Or is it deeper than that? 2. 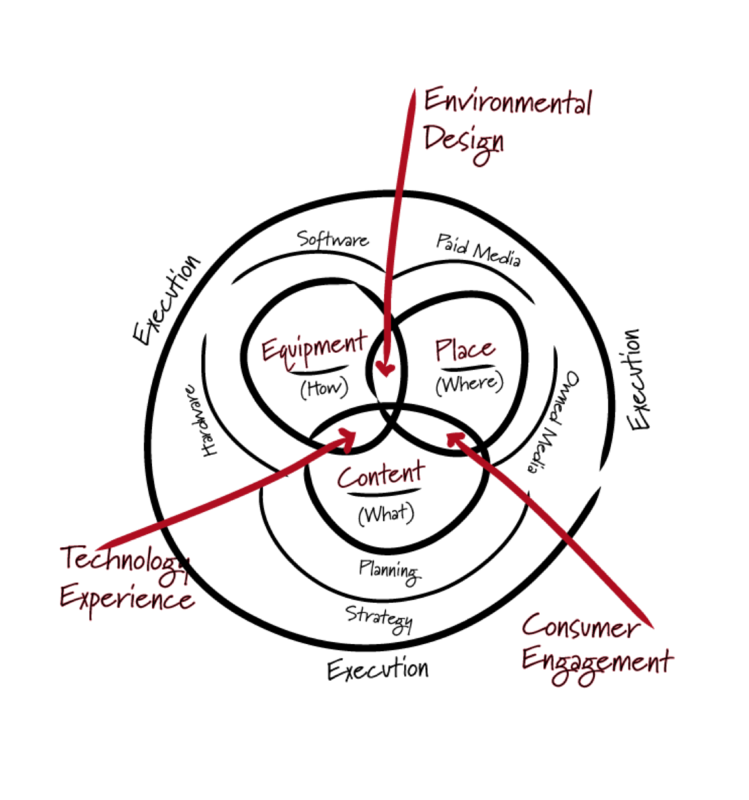 ENGAGEMENT – Interactivity and Engagement go hand-in-hand. Once something is interactive, it could be implied that it’s engaging. But not so fast. One does not necessarily make the other. The two are linked, yes, but true brand engagement might not be accomplished by simply taking an action. All actions are not created equal. If brands understand where consumers are in the funnel, they can drive true, meaningful brand engagement, all through some level of interactivity. Can this only happen with some scientific formula and an endless well of content? 3. PLACES/THINGS AROUND US TURNED “ON” – This is probably the most nebulous theme of them all, but I believe it’s just because we’re still quite a ways in front of the curve. In 2010, we saw bikes with brains. Trees that could talk. And interactive cars. But these are the exception. Technology is rapidly developing to the point where anything can be turned “on.” Will we see more and more places/things around us taking the place of physical “screens” in 2011? Or will we see more actual screens? 4. TELLING THE BRAND’S STORY – In college, me and my buddy had dreams of becoming the next Coen Brothers filmmaking dynamic duos. He’d direct, I’d write, and we’d both produce. It fit our skillsets and our passions perfectly. So, we grinded through the grind for many years trying to make that dream a reality, but in the end, it just wasn’t meant to be (ironically enough, he heads the film/video division for our company!) Every once in awhile, I get the itch to write another movie. I just haven’t been able to devote the long periods of time that it calls for with everything else going on in my life (I keep telling myself “when the kids are older.”) But over this holiday season, I’ve thought alot about that type of storytelling – the type with a beginning, middle, and end – compared to the brand type of storytelling – the type that’s structured around key messages and evolves over time – and how brands could write their story like a movie. It’s compelling and I’m going to dive deeper into it in the future. Can transmedia work for an automaker the same way it can work for a movie franchise? What does social media do to the story? “Uh-huh” – At the end of the day, from a brand’s perspective, it’s all about building relationships with consumers. These four themes are at the heart of doing just that. It’s not easy to do, but I want to uncover who’s doing a good job at it vs. who isn’t, especially when they’re reaching people outside of their home. “Duh” – I hope to not write as much about QR codes in the coming year. Yes, they provide a level of interactivity and engagement, and in some cases, drive the consumer deeper into the brand experience, but the complete solution – from a brand’s POV – needs to be improved. Mobile and Out-of-Home are linked together, and hopefully we’ll see more and more rich experiences involving the two. I’ve got to relax on the QR codes. So there you have it. I’m excited about this direction in 2011. Thank you all for joining me on this exploration. Your readership and support means an incredible amount to me. I truly appreciate every one of you. I hope you all have a safe, enjoyable and prosperous new year! See you on the flipside. This entry was posted in Friday 4-1-1, Marketing and tagged Digital Out of Home, Engagement OOH, Friday 4-1-1, Interactive Out of Home, Out of Home, Reverb 10 on 12/31/2010 by Mike Cearley. This is the final part in a multi-part series this week on Mobile Scanning Technologies. I think these types of technologies are powerful in the “new” OOH because they bridge the offline (real-world) with the online (virtual world). And the “new” OOH, to me, is all about connecting others with the places and things around them AND each other. For the 2nd time in this Friday-series, I’m late. I’m sorry for that. My wife is leaving for a 2-day trip today and I’ll be playing Mr. Mom, so last night was all about the two of us preparing for completely different weekends. The only time I could really find to write is in the quiet hours of early morning. So, here we are. While I certainly haven’t covered everything about code/image scanning technologies this week, I hope that I have covered some main topics that you find helpful – there was exploring their value, there were a couple of recent examples, and then there was looking ahead to what the future my look like for them. The only big thing I think I missed were some best practices of using and implementing these types of technologies into campaigns. I have documented best practices from my POV before, though, and if you’d like to see them, check this out. In the end, I hope you have enough information to know what they are/what they do/how to use them (from a user’s standpoint) and things to think about/practical execution guidance (from an implementor’s standpoint). There is lots of information out there on the interwebs about these technologies so all you really have to do is pull up your handy Google page and go to town. To make things easier for you, I thought it would be helpful to share some of my favorite places to get this type of information in this week’s Friday’s 4-1-1. Without further adieu, here it is, Resource style. 1. Socialwayne.com – I briefly met the author of this blog, Wayne Sutton, at SXSW last year (he was on the Chevy Roadtrip that I was working on), and I’ve followed him ever since. He’s put a lot of thought and focus on QR codes this year and always has insightful posts about them. He creates and doesn’t just talk, which I appreciate greatly. His latest post on these technologies is called, “10 new QR Code generators with analytics to bridge the mobile social online worlds and increase consumer engagement” – the title truly says it all and it’s worth checking out. 2. 2dbarcodestrategy.com – I don’t know how I feel about the author because I don’t see much engagement from him on the blog and/or on his Twitter channel, but he’s a machine in showing examples and providing some good thought behind 2D codes. His blog is laser focused – it’s only about 2D codes and he posts almost every day. If only he would engage with his audience. 3. pongrblog.com – I virtually met these guys earlier this year and once I found out about them, had to check them out. They started out as a pure image-recognition technology and now they’ve turned it into a image-recognition, social, mobile game. It’s very interesting. You can see all about them here. “Uh-huh” – early on in the life of this blog (and periodically throughout), I introduced a term – “enabling technologies.” Basically, these technologies, to me, enable an otherwise static display or article to become interactive. In this case, both of these technologies – code scanning and image scanning – are enabling technologies. Without them, the experience couldn’t be had. My view of “OOH” includes two different types of technologies – 1) display technologies (that just make something “digital” – 1 way) and 2) enabling technologies (that make something “interactive” – 2 way) and moving forward, this concept will be even more critical to the direction I want to go next year. “Duh” – there are many more resources that I’ve found helpful throughout the year. There are smart people out there who explore these very things and unfortunately, I’ve only listed 4 above. I’m giving myself the “duh” this week because I’m sure to have left off some great peeps. 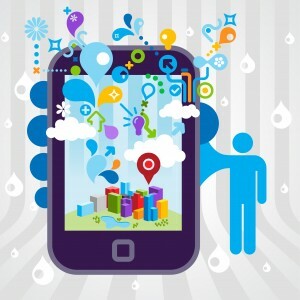 This entry was posted in Emerging Technology, Friday 4-1-1, Marketing, Mobile and tagged enabling technology, Friday 4-1-1, Mobile, MS Tags, QR Codes on 12/11/2010 by Mike Cearley. Happy Friday, everyone! Another week is over and we’re one more closer to the end of the year. I can’t believe it. It’s getting to be the time where the mad rush starts to “wrap things up” this year and everyone starts to look forward to the new year. I find this time of year to be both exciting and maddening because of this month-long dance between effort and anticipation. I’m choosing anticipation for this week’s Friday 4-1-1, coming at you with a first look at other’s looks into 2011. 1. 2011, A Tipping Point for DOOH? – very well rounded post from Ken Goldberg at Neocast. From someone who does not operate within the DOOH industry (particularly the media side of things), it sure does already seem like we’ve reached that tipping point. Look around and note how many digital screens you see. On my morning commute alone, I see 1 at the courthouse, 1 at a church, 1 on the train, 1 in my office building lobby, 1 in the elevator, and 1 on our office floor. Everywhere I turn, there’s a screen with content. I feel like consumer’s expectations are to see physical digital screens around them more often than not. Now, the question to me is: is 2011 going to be the tipping point for “everything’s a screen” and “Interactive Out-of-Home (IOOH)”? Privacy – “we will say goodbye to privacy. Actually that happened long ago, it’s just that people will stop caring.”….This is one of the big concerns about truly targeted place-based advertising – how creepy and invasive the thought of it is. My thought is aligned with Dave’s. People like to complain about it, but I’m not convinced that they really care. They want their lives to be made easier and more convenient, and if that involves giving up more and more of their privacy, so be it. I don’t know if people will ever “embrace” it completely, at least not for the foreseeable future, but I think they’ll “accept” it. They already have to a large extent. Flash vs. HTML 5 – this is big, too, to the DOOH industry. Much of the moving content in digital screens is created in Flash. Now, HTML 5 opens up possibilities that don’t have some of the handcuffs that Flash has, particularly in terms of compatibility. Who cares? Consumers don’t care. They just want to see moving, dynamic content. 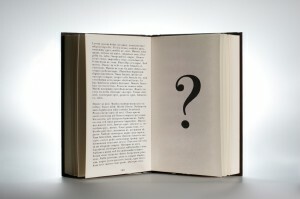 We – on the storytelling side – can’t lose site of the most important thing – telling the story in the most compelling way. The story’s the thing, not the technology to create and deliver it. Frivolous Technologies – ie QR codes – agree and disagree with him on this. More and more, QR codes are being introduced to the mass public by big brands. Will they stay? Or will they evolve into something else? Don’t know. But to me, the most important thing here – these types of technologies are not frivolous. They serve a critical need in today’s ecosystem by connecting the offline (real-world) with the online (virtual-world). I hope 2011 will be the year of the shakeout with these technologies (will there by 1 universal code or will codes begin to have similar, more comprehensive capabilities, will readers automatically be installed on all phones??? ), but I sure do hope they don’t disappear. Personally, I don’t see it happening. 3. 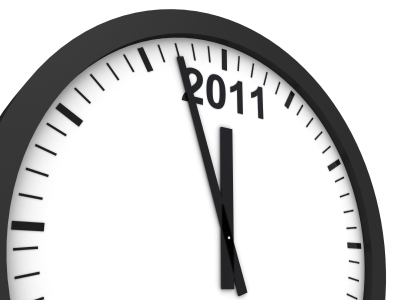 11 Consumer Trends for 2011 – this time brought to us by TrendWatching.com. Shout out to them for noting that trends don’t begin/end on a particular date. They evolve. Hope you get that message here, too. #1 “Trend” – Random Acts of Kindness. This is great because at the core is the idea that people are good and appreciate appreciation. 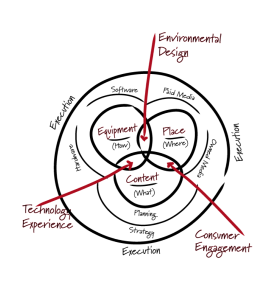 This requires connections – between people themselves and between brands with people. Particularly important to the OOH industry because it’s this connection – this real connection – that people crave, not dynamic, place-based ads. It’s the 2-way communication that they appreciate, not the 1-way push. It’s knowing, and seeing via action, that “someone’s on the other end,” not the dreaded black hole of awareness-driven, self-serving advertising. It’s the purposeful engagement that really matters. Another trend mentioned – Pricing Pandemonium. This section of the report talks about “always-on technology” and “connecting consumers to deals closer to the point of sale,” but never mentions any other screen than the mobile screen. True digital signage can make this new type of experience even more dynamic, working in concert with the mobile phone. I really think that the reason physical screens are not being mentioned by almost anyone outside of the industry is that a) we don’t really need them and/or b) the screens up right now are not providing the type of value to make others notice. Yes, they’re everywhere, but are they effective? Bringing every-surface-can-be-turned-on-and-made-into-a-screen right to your pocket. Doubt we’ll see something like this in 2011, but what will these devices be like a year from now, and more importantly, what kind of effect will they have on the places and things around us? 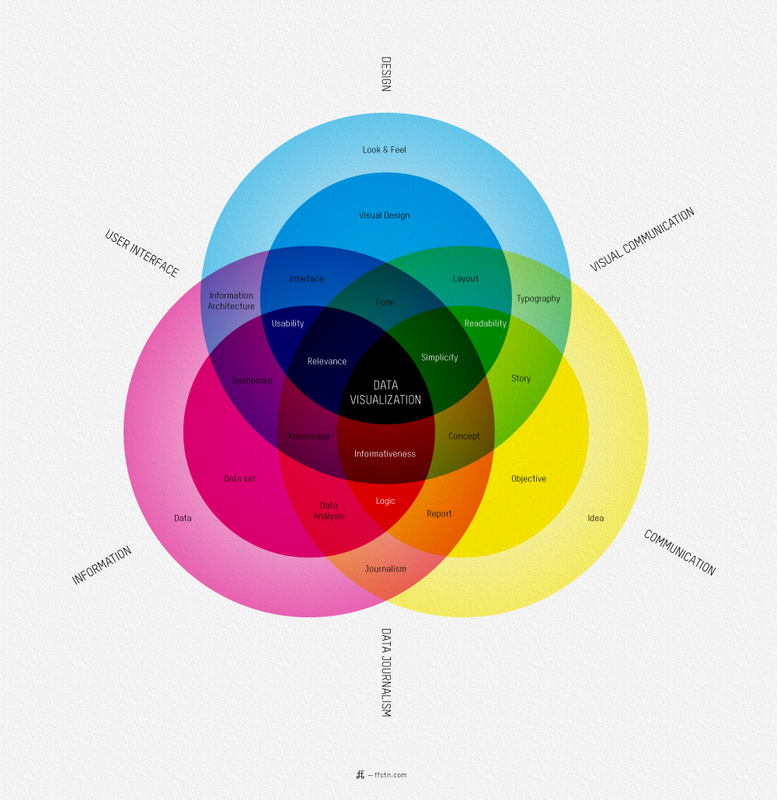 “Uh-huh” – I’m big on infographics and becoming big on the idea of data visualization. I presented a version of this infographic a few weeks ago – my vision of the components that make up any OOH initiative and insofar as the overlap goes, some of the finer things to think about when planning. For a complete explanation, check this out. It’s smart and makes a lot of sense, once you get over the overwhelming feeling. So, I ask myself the question – what if I turned mine into something like this? What “components” would each one of the sections of overalap result in? I think it could get real interesting. “Duh” – I talked to my team this past week about reflecting on the last year and specifically taking note of everything they’ve accomplished. As is the case for many of us, it’s been a long and trying year, but certainly not without reward. I find it easy to get bogged down in the disappointments and/or struggles that will inevitably be there each and every day, but it’s important to recognize the good things, the accomplishments, the blessings that we have experienced in our lives over the past year. Well, as always, I’d love to hear any of your thoughts. Just drop me a comment or a tweet, whatever you’re comfortable with. Thanks, again, for reading. Have a great weekend! This entry was posted in Friday 4-1-1, Mobile and tagged 2011, Digital Signage, DOOH, Friday 4-1-1, IOOH, Mobile, Neocast, offline to online, OOH, QR Codes, Trends for 2011 on 12/03/2010 by Mike Cearley.